Hammond got his Start in music Business in the US, playing drums in most known Jazz formations and regularly performing in various tours worldwide. 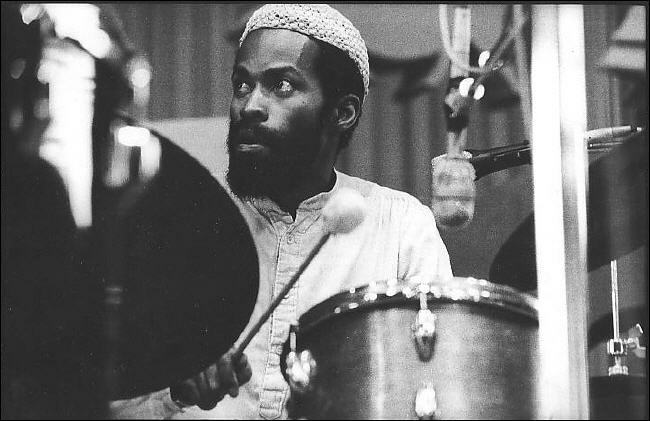 While performing wich Dorothy Ashby, Sony Rollins, Charles Mingus, Nina Simone, and Donald Bird he played mang other musicians, such as Ornette Coleman.Those meetings launched his incredibly successful career, and provided him with the Impetus he needed to begin a fall blown music life. Douglas Hammond moved to Austria in the 1989 where he produced his next albums and gained international musicians in to the European Music Industry. He tends to have a lot of faith in the intrinsic instincts of an artist. It is the rendering of the space in between those notes that helps give each performance its unique character and soulfulness.This may seem like a very logical assumption, but most productions fail to Illuminate and enhance that reality. Doug Hammond understands the value and beauty of using natural space to create unique live Bars and beautiful sound that have subtle immediacy, depth and color, a philosophy that can be really heard an his more than 30 recordings since 1963. Doug Hammond "A real Deal"
It is because of his empathy (that) he attempts to make the artists blossom intact, rather than trying to fit the artist in to his particular projects. After a string of credits with world known musicians next find was his own production company in 1974. His production sensibilities have influenced the cream of Europe's best musicians. In fact, it would be fair to say that it is almost impossible to hear Jazz music of the last 15 years without recognizing elements of Hammond's musical vision. Douglas Hammond is now teaching at the Anton Bruckner Private University for Music, Drama and Dance in Linz.Sound is most important. A good sound should be healthy for the human & not too loud for the hearing organ so as to cause damage. That's why acoustic music is my most important medium. Over the years, the quiet and elusive Hammond has turned down many requests for interviews. So fans of Douglas Hammond style will no doubt enjoy the anecdotes recounted here, and those looking to refine their musical sensibilities should appreciate the generous tips offered. Sonic pages is specially grateful for the time and care he took in helping us make this an special interview. How da you convey "open-mindedness und engagement" according to the printed principles of the Anton Bruckner Private University? My job is always to teach and help students to go beyond their wants and work towards their basic needs as musicians. There is this false concept that one develops technique then starts on the music. In reality it starts together on the level of one's development. What makes a musician is repertory, no matter what type of music. Openness is one requirement in order to advance. It is similar to learning to be a carpenter: After the basic study, one does not say one will build tables only because of one's wish. One would accept a real job as a carpenter to learn the trade and with experience in the ,real', one can decide with that experience to go in various directions. How important do you take the pedagogical mission to "bring music amongst the people"? I don't know of a pedagogical mission. My hope is that the various schools and universities which have jazz programs respect the tradition and innovators who created and advanced this music. The roots are most important for young people to know the truth! I also hope the various schools do not delude students into thinking they can create an individual style in a school. There has never been a unique style that came out of a school. After school, one has to deal with the real world of professionals. Schools can help when the truth is respected. Jazz is always reinventing itself. It is not fixed and finished. The profession is the real test and school. Music is a life-long learning experience. You are a curator of the "Jazz am Berg" concert series? What are you planning this year? "Jazz am Berg" is planning a year of our tradition of bringing the very best jazz and blues of known and unknown artists to Upper Austria. Amina Claudine Myers opened this year with a solo presentation: BLUES AND BEYOND, singing and playing piano on January 27, 2008 at St. Magdalena Bildungszentrum. Often asked probably, you've been the drummer for many giants in jazz history - How was your sit-in in Charlie Mingus's Big Band? Do you have a good story you will probably never forget? I never sat in with Mingus's big band. I played with the quintet. It was one of my best experiences where creative input was most open and favored. Mingus helped, guided and supported my musical efforts as a drummer and composer. He presented my music and arrangements, as documented on "Mingus Moves," to name one example. His quintet was one of my best schools. You like singing as well as playing the drums - What was the first sang you composed? I don't remember what song that could be, because some were lost as a teenager. The black music movement und society in America, in other words, the 60s: Where were you? How did you like participating und what were your efforts an this issue? How did you get into the Motor City (Detroit) scene? I was never in any organisation listed as a movement. However, in the '60s ('67-'70) I was vice president and coordinator of the DCMA (Detroit Creative Musicians Association), which presented music, poetry and stage presentations that included the broadest body of the jazz community in the Detroit area. Bruce Millan of the Detroit Repertory Theatre gave us the house to perform our productions and helped and taught us how to promote it. We eventually got help from a local black organisation, where we rented a space to have two nights of music, sometimes with two bands a night on the weekend. From the ticket sales we could pay a good fee to the bands, and this ran for two straight years. This organisation included the likes of: Marcus Belgrave, James "Blood" Ulmer, Harold McKinney, Wendell Harrison, Kenny Cox, Ron Brooks, Phil Ranelin, Leon Henderson (Joe Henderson's brother), Rosetta Heinz, Charles Moore, John Dana, etc. I asked Kirk Lightsey, when I met him at the jam session at the Mary Elizabeth Hotel in Miami in 1963, that if I came to Detroit, if I could work with him. He said yes! My teacher, Fletcher Davis, had suggested for me to go to Detroit to prepare for New York. Behind this background, what was your ambition, still at the end of 'SOs/'90s with Mbase, the African-American collective of talented young, now renowned musicians? I had no ambitions with M-Base. M-Base is a collective that made collective decisions based on the creative quality of music, input and performance. It is a continuous, endless process. Technical equipment/sound production and recording techniques: How important is sound for you und what is a good sound? Sound is most important. A good sound should be healthy for the human and not too loud for the hearing organ so as to cause damage. That's why acoustic music is my most important medium. I'm still open to go beyond at times. What advice can you give to studio musicians? What should they take care of before stepping into a demo project? I was never a studio musician as such. As for demos, it should be watched on a basis of musical experience one has had as a musician; a professional experience. Your Literature: Mr. DH- "a singing" poet on a drum kit? So far you have released four books. Are there more to come? By the way, you're going into retirement. What are your future plans? A new book is scheduled to be released in 2008. At this moment, I hope one year from now that I'm playing, composing and lecturing worldwide for 200 days a year. Music for as long as life is! Regarding your personal homepage and myspace site, you are described as an "enlightened keeper of old percussion values" and as a "remover, refiner, a renewer"- Now, what is true? These are inspiring words from Mr. Robert Urmann, with much respect for my mentors. Music is my life-long mission to reach the spiritual, physical and beyond as the voice of the soul. I believe music is the universal language which can help heal the divisions that cause aggression and misunderstanding and an elixir that can soothe our existence beyond words. Are there any final pearls of wisdom you can share with our readers? "Total love in the heart and truth will assist throughout existence, so long as sharing becomes the means of realizing HOLY is the total of all existence as one great whole to everlastingly and unceasingly be watched to preserve true harmony in this Great Melody of Living."